The Venango-First has two separated lenses, one is about 6 feet, 762'-766', and another 9 foot section, 788'-797', and both have decent porosity. The sand thickness has developed at this location along with its oil saturations. The upper and lower lenses both have a fair to good oil show. The Venango-Second has 16 feet of formation on the bottom lens, 916'-932', with good porosity and saturation and another 4 feet above it, 908'-912' that's producible with lesser values. The porosity on the lower lens has a fair to excellent show of oil with a poorer oil show in the upper lens portion. VEP recommended the balance of the infrastructure on the Rice Lease be completed first. After the infrastructure is installed, then Rice #15 well should be completed for production. On February 4, 2014, four of the five drilling permits on the Rice lease expired. The Operator, VEP, initiated the process to renew the four expired permits. The process for obtaining the permits may take 60 days or longer to obtain from the Pennsylvania Department of Environmental Protection. On April 28, 2014, the Department of Environmental Protection, Commonwealth of Pennsylvania issued well permits for the Rice #3, #5, #6 and #14 to drill 4 oil wells on the Rice lease. On May 30, 2014, the Company successfully completed and fracked the Rice #15 oil with 9 stages. On June 2, 2014, the Company began pumping the Rice #15 oil well. "NUX" Nux Holdings of Kentucky, Inc.
"XUN OIL-KY" Xun Oil of Kentucky, Inc., part of Oil & Gas Division of Xun Energy, Inc.
"XUN OIL-FL" Xun Oil Corporation, part of Oil & Gas Division of Xun Energy, Inc. ASSIGNMENT In oil and gas usage, assignment is a transfer of a property or an interest in an oil or gas property; most commonly, the transfer of an oil or gas lease. The assignor does the transferring and the assignee receives the interest of property. CRUDE OIL PRODUCTION Pressure from the reservoir forces the hydrocarbons (crude oil) from the pores in the formation, and moves them to the wellbore. A downhole pump connected by sucker rod to a pump jack artificially lifts the crude oil from the bottom of the wellbore to the top of the wellhead and into a collection tank. DEVELOPMENT OFFSET DRILLING Offset drilling program consists of drilling new wells within a proven and producing property. Well locations are selected by geologists based on known and historical data from producing oil and gas wells within the property or adjoining properties. DOWN HOLE PUMP OR BOTTOM HOLE PUMP Any of the rod pumps, high-pressure liquid pumps, or centrifugal pumps located at or near the bottom of the well and used to lift the well fluids. DRILLING RIG A drilling rig is a machine, which creates holes (usually called boreholes) and/or shafts in the ground. Drilling rigs can be massive structures housing equipment used to drill oil wells, or natural gas extraction wells. FARMIN AGREEMENT An agreement between operators whereby the owner (farmer) not wanting to drill a property agrees to assign all or part to the operator (farmee) desiring to drill; farmee assumes the obligation to drill one or more wells on the property to earn the assignment. FRACTURING The pumping of crude oil, diesel, water, or chemical into a reservoir with such force that the reservoir rock is broken and results in greater flow of oil or gas from the reservoir. GAS WELL A well that produces natural gas, which is not associated with crude oil. LANDMAN The individual who negotiates oil and gas leases with mineral owners, cures title defects, and negotiates with other companies on agreements concerning the lease. LANDOWNER The person who generally owns all or part of the minerals under his lands and is entitled to lease the same. LEASE (1) A legal instrument executed by a mineral owner granting exclusive right to another to explore, drill, and produce oil and gas from a piece of land; (2) Used in conjunction with the actual location of a well(s) or unit. LEASEHOLD An Oil and Gas property that is leased from the land owner for a royalty based on production of oil and gas from the property as developed by the leasee. LESSEE The person who receives the lease, sometimes called the tenant. LESSOR The person giving the lease, sometimes called grantor or landlord. NET REVENUE INTEREST The share of revenue, expressed in fractions or decimals, accruing to the working interest after deducting all lease burdens (royalty, overriding royalty, or similar burden). OFFSET WELL (1) A well drilled on the next location to the original well. The distance from the first well to the offset well depends upon spacing regulations and whether the original well produces oil or gas. (2) A well drilled on one tract of land to prevent the Drainage of oil or gas to an adjoining tract where a well is being drilled or is already producing. OIL & GAS LEASE A contract between mineral owner, otherwise known as the lessor and a company or working interest owner, otherwise known as the lessee in which the lessor grants the lessee the right to explore, drill and produce oil, gas and other minerals for a specified primary term and as long thereafter as oil, gas or other minerals are being produced in paying quantities. This lease gives the lessee a working interest. The oil and gas lease is granted in exchange for royalty payments to the lessor. It is simply a "ticket to hunt". OIL WELL A well that produces crude oil, which is not associated with natural gas. OPERATOR Company which operates an Oil and Gas Lease, either on its own behalf, or, if a member of a consortium, on behalf of Lessee’s. Takes primary responsibility for day-to-day operations for an activity (exploration, development, or production) on the Oil and Gas Lease. OVERRIDE ROYALTY An overriding royalty interest can be assigned from a working interest owner to a person. An overriding royalty interest may also be generated by someone who has leased a person’s minerals and then assigns their leasehold to a working interest owner and retains an override. Neither a royalty nor overriding royalty interest owner pays any well costs associated with the drilling, recompletion or workover of a well. They also do not pay any of the monthly operating expenses associated with a well. Like mineral and royalty owners, the owner of overriding royalty interests receives a portion of the income from the production of oil and gas. The main difference is that the owner of an overriding royalty does not own the minerals under the ground, only proceeds from the production of minerals. Once the lease has expired and production has ceased, the overriding royalty interest expires. Conversely, the owners of minerals and royalties maintain their ownership after production ceases. PLUG To fill a well’s borehole with cement or other impervious material to prevent the flow of water, gas or oil from one strata to another when a well is abandoned; to screw a metal plug into a pipeline to shut off drainage or to divert the stream of oil to a connecting line to stop the flow of oil or gas. PLUGGING A WELL To fill up the borehole of an abandoned well with mud and cement to prevent the flow of water or oil from one strata to another or to the surface. In the industry’s early years, wells were often improperly plugged or left open. Modern practice requires that an abandoned well be properly and securely plugged. PROPERTY Land covered by the Oil and Gas Lease. PRODUCTION The process of extracting crude oil or natural gas from the underground formations to the surface via natural reservoir pressures or by artificial lift. PROVED DEVELOPED RESERVES Proved reserves that can be expected to be recovered (i) through existing wells with existing equipment and operating methods or in which the cost of the required equipment is relatively minor compared to the cost of a new well, and (ii) through installed extraction equipment and infrastructure operational at the time of the reserves estimate if the extraction is by means not involving a well. PROVED RESERVES Proved oil and gas reserves are those quantities of oil and gas, which, by analysis of geoscience and engineering data, can be estimated with reasonable certainty to be economically producible - from a given date forward from known reservoirs, and under existing economic conditions, operating methods, and government regulations – prior to the time at which contracts providing the right to operate expire, unless evidence indicates that renewal is reasonably certain, regardless of whether deterministic or probabilistic methods are used for the estimation. The project to extract the hydrocarbons must have commenced or the operator must be reasonably certain that it will commence the project within a reasonable time. (i) The area of the reservoir considered as proved includes: (A) The area identified by drilling and limited by fluid contacts, if any, and (B) Adjacent undrilled portions of the reservoir that can, with reasonable certainty, be judged to be continuous with it and to contain economically producible oil or gas on the basis of available geoscience and engineering data. (ii) In the absence of data on fluid contacts, proved quantities in a reservoir are limited by the lowest known hydrocarbons (LKH) as seen in a well penetration unless geoscience, engineering, or performance data and reliable technology establishes a lower contact with reasonable certainty. (iii) Where direct observation from well penetrations has defined a highest known oil (HKO) elevation and the potential exists for an associated gas cap, proved oil reserves may be assigned in the structurally higher portions of the reservoir only if geoscience, engineering, or performance data and reliable technology establish the higher contact with reasonable certainty. (iv) Reserves which can be produced economically through application of improved recovery techniques (including, but not limited to, fluid injection) are included in the proved classification when: (A) Successful testing by a pilot project in an area of the reservoir with properties no more favorable than in the reservoir as a whole, the operation of an installed program in the reservoir or an analogous reservoir, or other evidence using reliable technology establishes the reasonable certainty of the engineering analysis on which the project or program was based; and (B) The project has been approved for development by all necessary parties and entities, including government entities. PROVED UNDEVELOPED RESERVES Undeveloped oil and gas reserves are reserves of any category that are expected to be recovered from new wells on undrilled acreage, or from existing wells where a relatively major expenditure is required for recompletion. (i) Reserves on undrilled acreage shall be limited to those directly offsetting development spacing areas that are reasonably certain of production when drilled, unless evidence using reliable technology exists that establishes reasonable certainty of economic producibility at greater distances. (ii) Undrilled locations can be classified as having undeveloped reserves only if a development plan has been adopted indicating that they are scheduled to be drilled within five years, unless the specific circumstances, justify a longer time. (iii) Under no circumstances shall estimates for undeveloped reserves be attributable to any acreage for which an application of fluid injection or other improved recovery technique is contemplated, unless such techniques have been proved effective by actual projects in the same reservoir or an analogous reservoir, or by other evidence using reliable technology establishing reasonable certainty. PUMPER An employee of an operator who is responsible for gauging the oil and gas sold off the leases he has been assigned and who is also responsible for maintaining and reporting the daily production. PUMP JACK A pump jack (nodding donkey, pumping unit, horsehead pump, beam pump, sucker rod pump (SRP), grasshopper pump, thirsty bird, jack pump) is the over ground drive for a reciprocating piston pump in an oil well. It is used to mechanically lift liquid out of the well if there is not enough bottom hole pressure for the liquid to flow all the way to the surface. RESERVOIR A subsurface, porous, permeable or naturally fractured rock body in which oil or gas are stored. Most reservoir rocks are limestones, dolomites, sandstones, or a combination of these. The four basic types of hydrocarbon reservoirs are oil, volatile oil, dry gas, and gas condensate. An oil reservoir generally contains three fluids—gas, oil, and water—with oil the dominant product. In the typical oil reservoir, these fluids become vertically segregated because of their different densities. Gas, the lightest, occupies the upper part of the reservoir rocks; water, the lower part; and oil, the intermediate section. In addition to its occurrence as a cap or in solution, gas may accumulate independently of the oil; if so, the reservoir is called a gas reservoir. Associated with the gas, in most instances, are salt water and some oil. Volatile oil reservoirs are exceptional in that during early production, they are mostly productive of light oil plus gas, but, as depletion occurs, production can become almost totally completely gas. Volatile oils are usually good candidates for pressure maintenance, which can result in increased reserves. In the typical dry gas reservoir, natural gas exists only as a gas and production is only gas plus fresh water that condenses from the flow stream reservoir. In a gas condensate reservoir, the hydrocarbons may exist as a gas, but, when brought to the surface, some of the heavier hydrocarbons condense and become a liquid. ROD (SUCKER ROD) Steel rods that are screwed together to form a “string” that connects the pump inside a well’s tubing down hole to the pump jack on the surface; pumping rods. ROYALTY A percentage interest in the value of production from a lease that is retained and paid to the mineral rights owner. The share of the production or proceeds therefrom reserved to the lessor under the terms of the mineral lease. Normally, royalty interests are free of all costs of production (as distinguished from costs of marketing) except production taxes, and is established in the lease by reserving a royalty, which is usually, expressed fractionally (i.e. 1/8). SERVICE RIG A service rig is a piece of equipment, which is used for servicing wells such as oil and gas wells. Service rigs are not intended for drilling, but for the completion of other tasks related to operating oil and gas wells. Some companies, which operate wells, maintain their own service rigs, while others prefer to rent them because they can be very expensive. Specialty crews run service rigs when they are needed for routine maintenance and emergencies. SWAB A tool, which is lowered down the pipe on a wire line. The "swab" is then pulled out of the hole. As it travels up the pipe, rubber elements expand so that the fluid in the pipe is trapped above the swab and pushed to the surface. This operation is necessary when the formation pressure is not high enough to blow the fluids in the pipe to the surface. TOP HEAD LEASE A lease acquired while a mineral lease to the same property is still in effect. The top head lease (held by a different company) replaces the existing lease when it expires or is terminated. TUBING Relatively small-diameter pipe that is run into a well to serve as a conduit for the passage of oil and gas to the surface. WELLBORE The hole drilled by the bit that is equipped for oil or gas production on a completed well. Also called Well or Borehole. WELLHEAD The equipment at the surface of a well used to control the pressure; the point at which the hydrocarbons and water exit the ground. WELL LOCATION Well Location is defined as a circle having a radius of the well bore centre, to a depth as allowed in the Master Lease. Does not includes rights to minerals beyond the circle of the radius of the well bore centre. WILDCAT WELL An exploration well that is drilled to an unproven reservoir from which no oil or gas has been produced in the nearby area. A "rank" wildcat is drilled in an area distant from previous drilling. WORKING INTEREST The right granted to the lessee of a property to explore for and to produce and own oil, gas, or other minerals. The working interest owners bear the exploration, development, and operating costs on a cash, penalty, or carried basis. 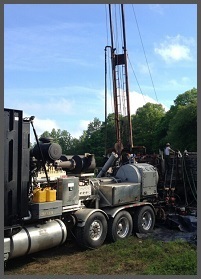 WORKOVER Operations on a producing well to restore or increase production. A workover may be performed to stimulate the well, remove sand, or wax from the wellbore, to mechanically repair the well, or for other reasons. The performance of one or more of a variety of remedial operations on a producing oil well to try to increase production. Examples of workover jobs are deepening, plugging back, pulling resetting liners, and squeeze cementing. Links from around the web with educational value pertaining to the Oil & Gas industry. Details regarding Xun's Energy Division will be posted here when available. Details regarding Xun's Mining Division will be posted here when available.